The smallest hauntique in the Surnateum's collection. 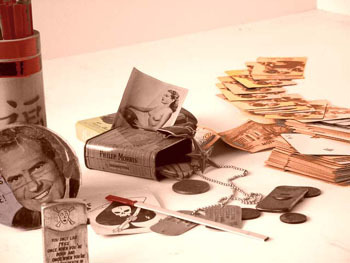 Apart from the pack of cards, the full kit of a soldier in the Vietnam war fits in a metal cigarette box. A lighter engraved with the word 'brother', medals, banknotes, etc. Everything dates from 1968. Story recounted by Thomas Gillaspie, reported by the Curator. It was in December 1989. I can't remember the exact day, but what does it really matter? The hippie was probably about 40, but he looked 10 years older. His name was Thomas Gillaspie and he was clearly starving. So I invited him to have something to eat at the Hamburger Hamlet, located on Hollywood Boulevard just across from Grauman's Chinese Theatre. We had met earlier that morning at the Hollywood Magic Shop, just down the street, and had hit it off. Naturally we talked about magic and the strange things that sometimes pop up in our everyday lives, disorienting us forever after. At the end of the meal, as we sipped our coffee, he asked me if I had already met my doppelgänger. "Did you know that 'Thomas' means 'the twin'?" There is a legend from deep in Asia that everyone on earth has a double who is identical in every way, but it is very rare indeed for a person to actually meet his double. Apart from true twins and exceptionally rare cases - like King Umberto of Italy and Shelley, who saw his double shortly before his death, for instance. It happened to me when I was 10 years old, at the Baptist church in my hometown. We came face to face on our way out the church after the service. Just imagine how surprised you'd be if you found yourself looking into your own eyes. His name was Montague Clifton Jr,. He was from Milwaukee and his family had just moved to my town. We both felt like we were looking in a mirror. His hair was a bit longer than mine, but that was the only difference. Our parents were just as taken aback as we were because, apart from our clothes, it would have been impossible to tell us apart. From that moment on, we were best friends. We went to the same school and later went out with the same girls. We were inseparable and we often played practical jokes on people, taking advantage of the fact that we looked identical. Even a blood test wouldn't have helped because we were both O+. We even thought about staging a magic show, since having a double opened up all kinds of interesting possibilities. "You only live twice: once when you are born, and once when you look death in the face." "You are going to live or die twice. I cannot see anything else; it's very strange." I was deeply shaken by his prediction. Upon returning to the base, I told Junior and the guys in my platoon about the prophecy. 'Eight Ball Sam' was a Blue Boy, in other words a black man steeped in the voodoo tradition of Louisiana; he offered to read the cards for us and counter the curse. First he shuffled a deck of poker cards and asked me to remove one. It was the 2 of Spades. "Snake Eyes Spades", the look of Damballah, the death that we see twice. The suit of Spades represents changes, the 2 of Spades a double death; the old gook was telling the truth." "Whatever you do, don't do that. You'll enrage the orishas. If you want to counter the spell, then turn the 2 of Spades over in the deck." Junior had just turned the card over when the entire world around us exploded in an appalling din. When I came to, everyone was dead. I was the only one spared by Charlie's mortar blast. I was groggy, but unhurt. Clifton's body was on top of me. Sam, Johnson and the other members of the squad had been torn to pieces. Next to me, totally intact, was the deck of cards, spread out. But it was no longer the 2 of Spades that had been reversed in the centre of the deck, but the Ace of Spades. I had spent one of my two lives. Ever since then I've suffered from headaches, migraines and memory disorders. I sometimes wonder if it was Thomas who died that day in Quan Tri." He thanked me for the meal and left me evidence of his story as a souvenir. "Maybe that will help me forget!," he added, and the last thing he did before disappearing was to light a Lucky Strike. When the pack of cards is activated in association with the story, the 2 of Spades appears.